LaCie continues to produce innovative designs for USB thumb drives -- not only designed with fun and interesting looks, but also for practical and useful purposes. For example, the LaCie MosKeyto is designed in a tiny low-profile package, so it can be inserted flush in a USB port on your computer, to avoid sticking out far enough to be accidentally knocked and damaged (see earlier post). And the LaCie imaKey and itsaKey (and others) are designed as actual metal keys, which makes them convenient and rugged enough to carry on a key ring (see earlier post). But for even more physical security for your important files, there's the LaCie XtremKey, designed with a thick metal pipe casing to protect your data from the elements. The larger end of the tapered cylinder casing unscrews to remove the USB stick, which is sealed with wear-resistant screw threads and rubber O-ring. The XtremKey is heat-, cold-, water-, pressure- and drop-resistant: drop tested to 16 feet, watertight up to 333 feet, and resistant to temperatures from +200 to -50 degrees C (though I haven't tried running it over with the specified 10-ton truck). Plus, the XtremKey is designed for speed, with transfer speeds up to 40 MB/s (read) and 30 MB/s (write). So if you need an All-Terrain USB Flash Drive, the LaCie XtremKey is available with 8 GB of storage for $49, 16 GB for $79, 32 GB for $129, and 64 GB for $229. The LaCie USB key products also include 4 GB of online storage for 2 years through LaCie's Wuala cloud storage service (see earlier post). The Breffo Spiderpodium lives up to its name as a multi-purpose gadget grip and podium to holster, dock, and display for your compact handheld devices, including smartphones, cell phones, portable media players, and game systems. Its eight soft-touch rubberized notched legs flex and bend into any position, to grip your device securely and then set it at virtually any angle, in any position, in any location. You can set up the Spiderpodium to view on a desk or table, hook or hang it in a car, or wrap it on a bike or backpack to go. And it spreads down flat for storage and travel. The original Spiderpodium for handheld devices has legs that reach approximately 8 inches, and is available for $19.99 in white or black. There's also a larger SpiderpodiumTablet for the iPad and other tablet devices, for $34.99 in grey or black. See related article - iPad Cases for 2011 and previous post on the Joby GorillaMobile Yogi. Pinnacle Studio is a venerable name in consumer video editing, and Avid is continuing that tradition with the release of Studio version 15 (while starting to depreciate the "Pinnacle" name). This new version focuses on "empowering hobby videographers and editing enthusiasts to make professional-quality movies at a fraction of the cost." This is a year of consolidation in consumer editing, without huge new technology upgrades as in the past with HD, AVCHD, and Blu-ray. As a result, the focus is on enhancing the user interface to make editing easy for casual users, while still providing impressive capabilities for more advanced users. Studio 15 adds new technology with Intel processor optimization for improved playback speed and performance, and support for additional formats including DivX Plus HD, YouTube HD, QuickTime HD, and AVCHD Lite. And it includes a new Archive/Restore feature to back up all your project data in a single location, and conveniently transfer projects between multiple PCs. Plus, the Studio 15 products pile on additional content and plug-ins to enhance your projects, starting with more than 1800 built-in effects, titles, and transitions. 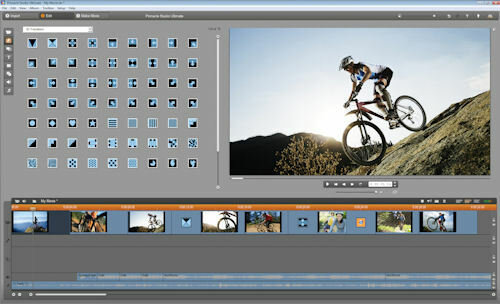 Studio HD for $59 is the base product. Studio HD Ultimate for $99 adds Blu-ray burning, Dolby Digital 5.1 surround sound, Keyframe effects, and the Motion Titler, plus two Red Giant plug-ins and a content pack of more than 200 more titles, sound effects, and DVD menu templates. Studio HD Ultimate Collection for $129 includes a 5 x 6 foot green screen for creating chroma-key effects, plus another four Red Giant plug-ins and another effect pack. The base Red Giant plug-ins are Knoll Light Factory for light and lens flares and ToonIt for video animations. The additional four are Trapcode Shine for light ray effects, Particular for 3D smoke, explosion, and rain effects, Magic Bullet Looks for looks and mood, and Trapcode 3D Stroke for animation and 3D effects. Avid also has announced a new Avid Studio product for the next step in consumer editing, extending the Pinnacle Studio approach for editing enthusiasts. You can download a free 30-day trial edition of Pinnacle Studio Ultimate version 15 to try it out for yourself. We've come to rely on USB as a universal data interface, especially as more devices use standard USB ports for both data and charging. However, you can be unpleasantly surprised to discover that USB is not a universal power interface. It turns out that more sophisticated devices like the Apple iPad, some smartphones, and Flip camcorders charge fine when connected to a computer, but not with common USB wall or car adapters. So we'll be seeing more devices like the recently-reintroduced ZAGG ZAGGsparq 2.0 portable USB charger and battery, which includes two USB ports -- a general port for charging Standard USB devices, and an optimized port to charge the iPad, iPhone, and similar devices. Plus the ZAGGsparq is not just a wall charger, it also contains a battery with enough capacity to deliver four full recharges for the iPhone, or charge iPad from 0 to 60%, and at same rate as iPad wall charger. The design with battery is a bit chunkier than a plain USB wall adapter, at 3 1/2 x 3 1/2 x 1 inches and just over 8 1/2 ounces. It has LED status lights to show the charge level, and pivoting power prongs that fold into the unit for travel. The ZAGGsparq 2.0 is available for $99, to help keep your smartphone or iPad running during a long and busy day away from wall power. Entries posted to Manifest Tech Blog in March 2011, listed from oldest to newest.